There was a time that getting prescribed glasses from a Fresno optometrist got you labeled with words like “nerd” or “geek” but my how times have changed! Now it’s considered extremely fashionable to wear glasses, with everyone from celebrities to professional athletes spending big bucks to wear fake glasses to look cool–yes, you read that right. Whether you wear eyeglasses to look cool, or simply because you enjoy being able to see things that are further than a few inches in front of your face, there are a few essential accessories that will make your life easier. Every eyeglass wearer should have an easily-accessible repair kit in their home or car. There are even some that are small enough to fit in your purse or backpack! These kits come with specially-sized screwdrivers that allow you to tighten the hinge screws that love to come loose over time. 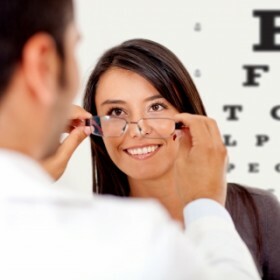 After taking the time to visit our Fresno optometrist office for an eye exam, and then waiting while your glasses are customized to correct your vision, you don’t want to risk damaging them. Tossing glasses in a purse or on a nightstand without any protection makes it easy to scratch or drop them. Why not secure them in an adorable personalized glasses case instead? These cases are a great way to protect glasses while traveling as well. Have you ever noticed that no matter how much you rub at them with the edge of your shirt, your lenses never really seem to get clean. That’s because you’re cleaning them with the wrong type of fabric! No collection of eyeglass accessories is complete without a couple of microfiber cleaning clothes. With these cleaning cloths, it will seem like you’re looking through completely new lenses.